Windows 10’s My People feature addresses a need some of us have, at least some of the time: a simple reminder that our friends are thinking about us. My People is a new feature within the Windows 10 Fall Creators Update. (Note: We’ve tested it as part of Windows 10’s Insider Program, so Microsoft may still be ironing out any small bugs we experienced.) It allows you to select your three best friends and symbolically place them near you, via icons in the taskbar. 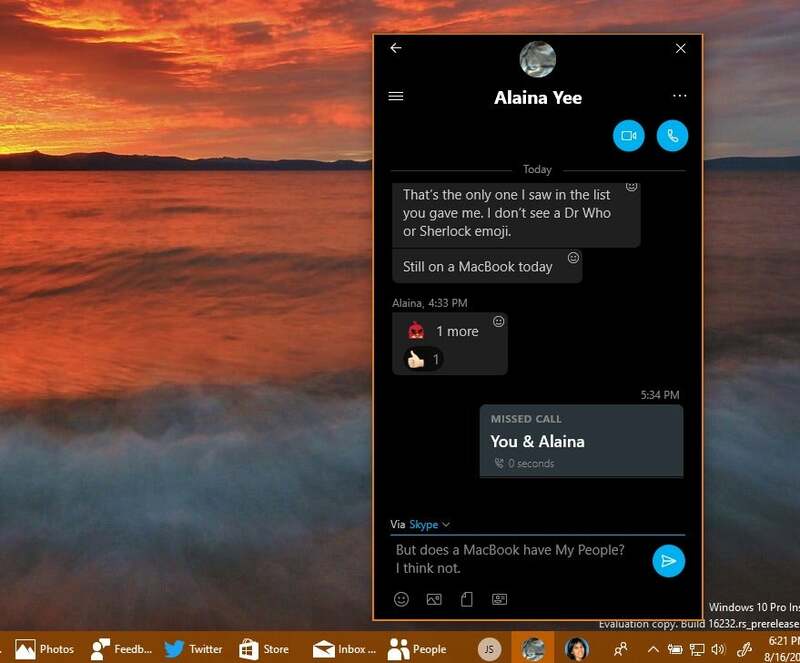 Just as you might stop by for a chat, My People allows you to quickly Skype or email them—and just them—all from a single button on your taskbar. And the best feature is how they can respond: “Shoulder taps” pop up emoji right from your taskbar, so that your friend can wave hello. Think of My People as Skype and Mail, turned on their heads. With Mail, you can send email to anyone in the world, or chat via Skype with its millions of users. My People focuses those apps on just three friends. It’s a great concept, though only partially realized. Ideally, My People would collect all the different ways of reaching your friends and put them all under your thumb, but that’s a future that hasn’t yet arrived. My People’s icon lives on your Windows 10 taskbar. Microsoft formally launched My People as part of Windows 10 Insider Build 16184, at the end of April. (Remember that it was one of the features originally slated for this spring’s Creators Update, though it missed its deadline.) To use it, you’ll either need to download an Insider build, or just wait for the Fall Creators Update to drop around September. Click the button to begin the My People setup process. Microsoft formally refers to My People as an “experience,” because it simply focuses the existing People, Mail, and Skype apps into a unified interface. Before you begin, make sure to update all three apps if you haven’t already, via the Windows Store. The My People experience begins by clicking the People icon on your taskbar, down in the lower right-hand corner, and next to the upward-facing caret that hides some of your other, less-important taskbar icons. Microsoft picked my five most popular contacts, some of which I’ve obscured for privacy’s sake. When you click the My People icon for the first time, Windows will begin the setup process, listing what it thinks are your five most popular contacts. (Though My People initially selects five contacts, you can pin only three.) It just so happens that I email myself links to news stories and other things of interest when I’m on my phone, so my own email accounts were the most popular suggestions. If you can’t immediately find the friend you were looking for, you can search for that friend in the search box below. 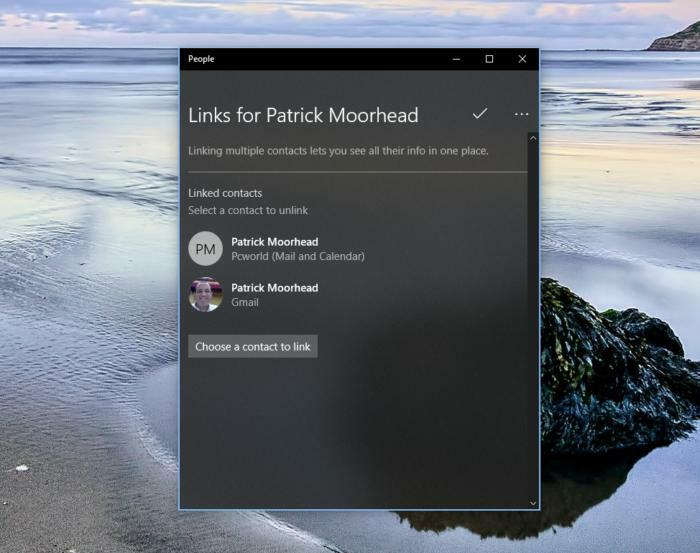 Remember that these are the most popular contacts in the Windows ecosystem, so your close friends on other platforms, such as Facebook, might not be included. It’s possible that you might have to open the Windows 10 People app, add a new contact, then search for that person within My People. Keep in mind that these are personal contacts, not professional ones. You can certainly select a professional colleague as a My People friend, and exchange Mail with her professional email address. However, My People uses the Skype UWP app within Windows, not the Skype for Business app some businesses use. You’ll probably need to ask your friend for their Skype username—good luck hunting down the right “Michael Brown” within Skype’s massive list. Once you have the right contact, make sure to send them an invitation within Skype to add you as a contact. Sometimes, after adding a Skype contact, you’ll need to close and reopen the My People app to ensure the data has been correctly handed off. 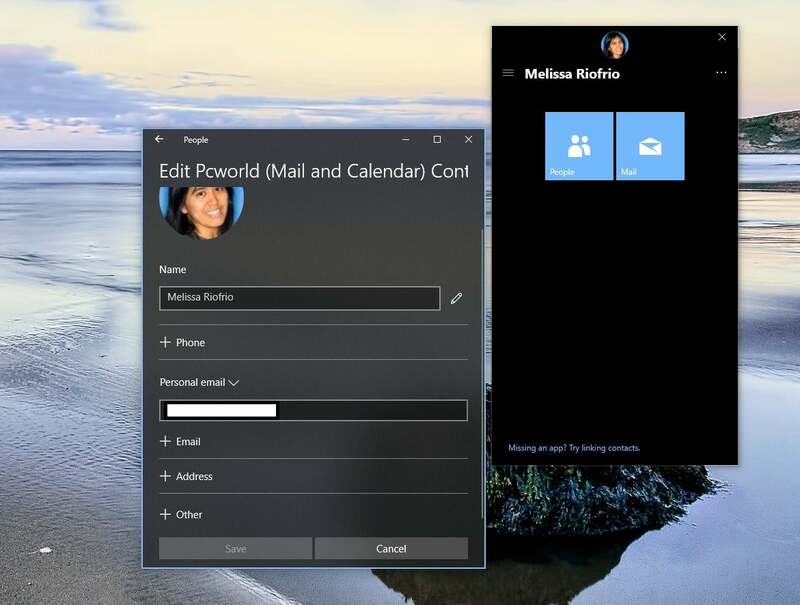 If you need to add a contact, you’ll need to open the separate People app within Windows 10, then either edit the existing contact, or create an entirely new one from scratch. I found, somewhat ironically, that if I added my personal Gmail account to Mail, then imported those contacts, some of the imported data (including profile pictures) was richer than what I had included for my Microsoft contacts. Combining accounts is an easier way of collating all the data. While this all sounds terrifically complicated, there’s one shortcut. Try clicking the message at the bottom of the My People screen: Missing an app? 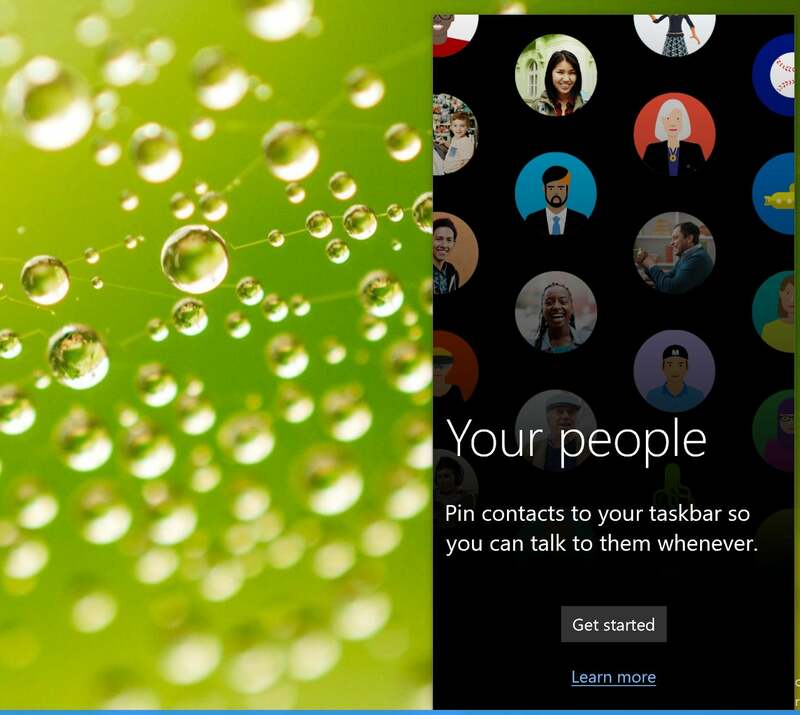 Try linking contacts. That brings up a list of all of the contacts Windows has for a given person, including Skype. You can then “link” the profiles to compile all of the information under the person’s name. That can save some time! Once you’ve selected and pinned your first three contacts, you’ll see their icons show up in your taskbar, next to the My People app. Their names will be indicated by either an icon with their initials, or a small profile picture if they’ve included one. You can always search the People app for your favorite contacts. Technically, you can actually pin more than three contacts—the additional contacts are stored within the My People app itself, and show up when you open the People tab. This all probably assumes that at some point you’ll be able to choose how many My People contacts Windows allows. My People works best when you enable all three communication options. You’ll notice that the main My People page includes two tabs: People, which you’ve just selected; and Apps. 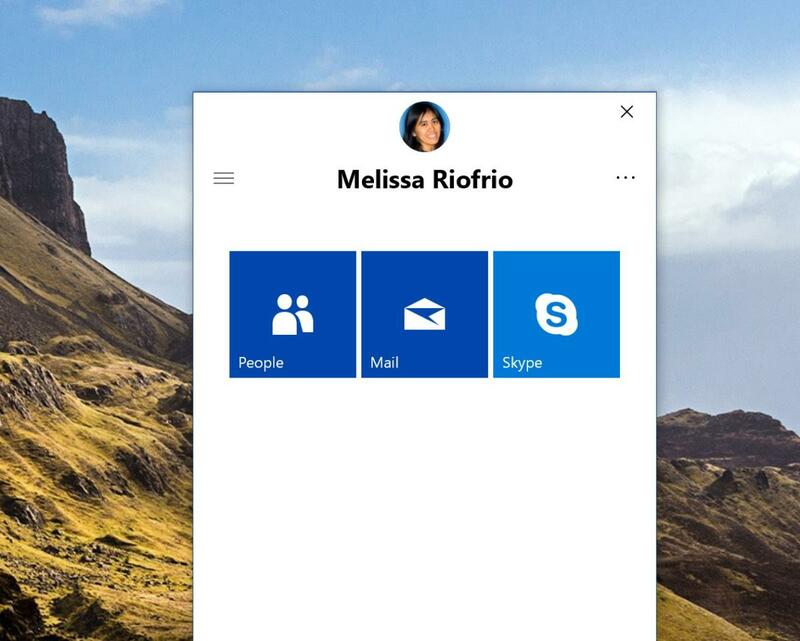 If you’ve successfully added Mail and Skype profiles for your friends, you should see this section populated with People, Mail, and Skype buttons, which will (finally!) trigger directed conversations with your friends. Unfortunately, Windows doesn’t reveal how many ways it has to connect with your friends, nor does it even bother pushing other services it owns, such as LinkedIn. More importantly, if you’ve never connected with a friend on Skype, it won’t even show up as an option. Fortunately, after all of the setup has been completed, actually using My People is a snap. 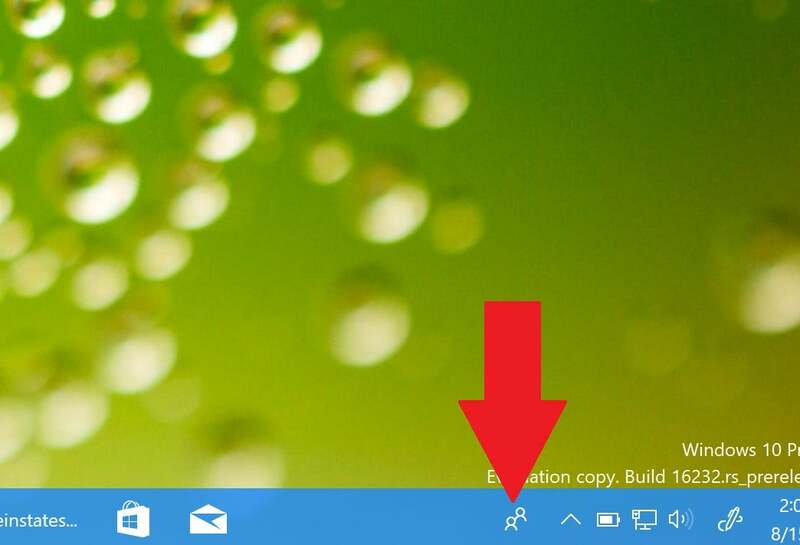 Each time you click your friend’s taskbar icon, a small vertical window opens, about the size and shape of the window that opens when you click the Cortana search bar. Once you open My People, the app will remember the last way in which you communicated. If you sent an email message, Mail will automatically open. 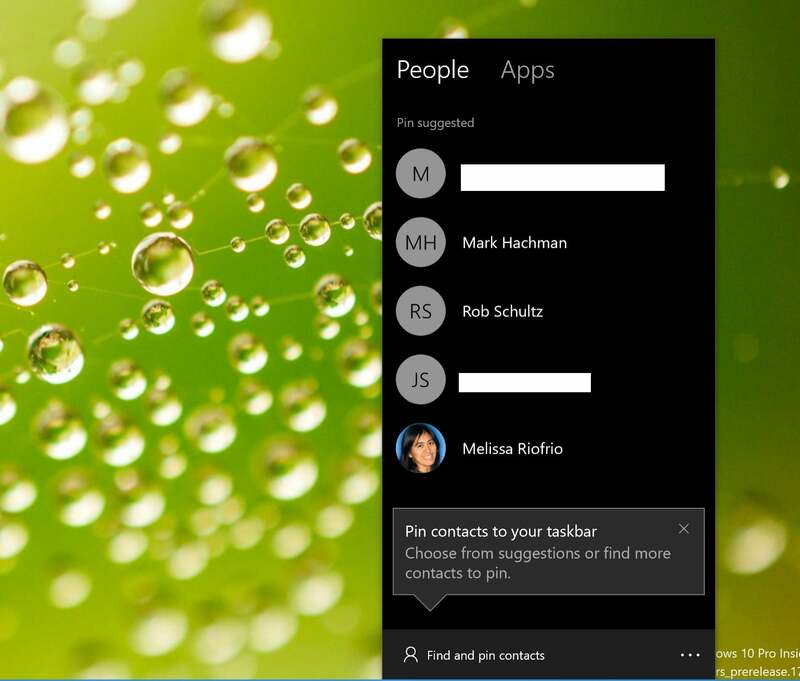 Tap the My People contact on the taskbar, and you’re instantly into whatever app your friend prefers. Given the complexity of the setup, the efficiency of My People may seem like a bit of a letdown. Essentially, My People’s strength is as a conduit to a specific person, with minimal effort. Unlike the full-fledged Mail app, My People’s version of Mail will simply show the emails you and your friend have sent back and forth. 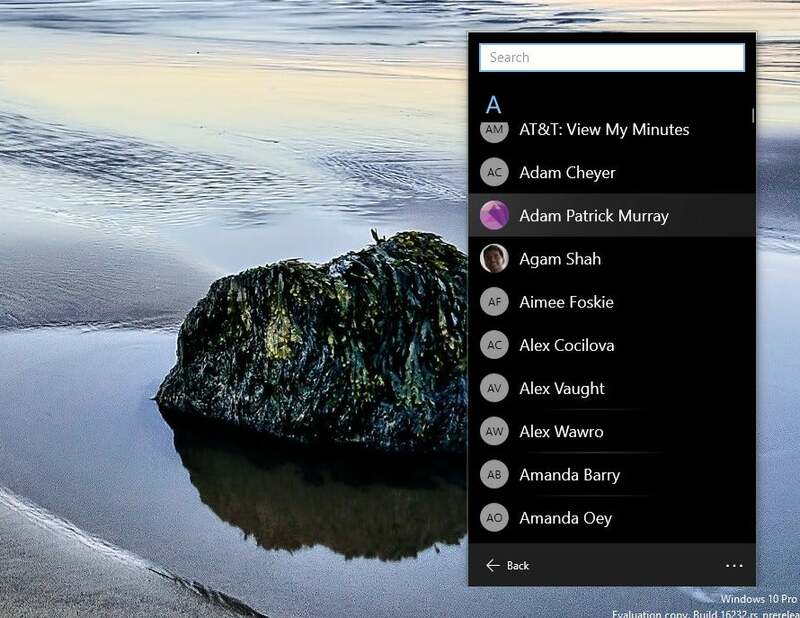 Skype defaults to a chat interface, again between you and your friend. (You can place voice and video calls, too.) The People app will simply list the interactions you and your friend have had. If it sounds simple, it is: Click the contact, select the app (if necessary) and chat. At this point, My People is still a bit buggy. I’ve been able to open Skype within my People with some contacts, and not with others. Mail works efficiently, however. You can see how My People could become truly enjoyable with what Microsoft calls “shoulder taps.” Not surprisingly, whenever you receive a notification, the Action Center or Mail icon displays an overlay highlighting the number of unread messages. My People does the same. With a My People’s “shoulder tap,” your friends can wave hello. 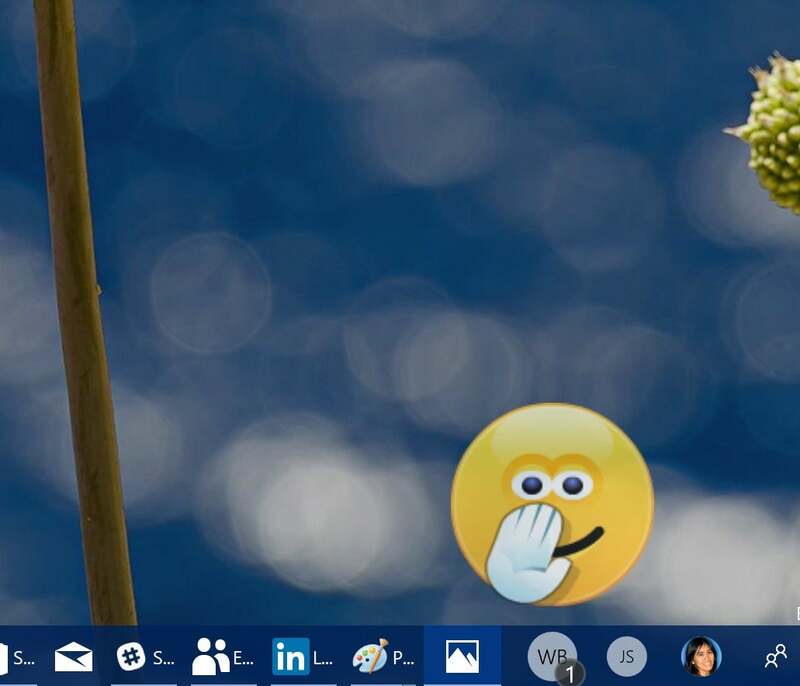 When one of your My People friends sends you an emoji, however, it won’t just show up as a numerical indicator: It will actually “pop up” on your taskbar, showing off the emoji right on your screen. It can occasionally be confusing—“what is she laughing at?”—but it’s still a nice way to convey attention, regardless of any particular reason. For now, however, Shoulder Taps have a limited range. Skype currently includes a list of small GIFs, complete with sounds, from popular shows like Sherlock or Fawlty Towers, which you can send within the app itself. If you try to send those as a Shoulder Tap, though, they don’t work—they merely act as another Skype message. What limits the appeal of My People, obviously, is its limited number of apps. MyPeople essentially remains little more than Skype or email. If you connect with friends via Facebook, or WhatsApp, or Allo, Snapchat, Telegram, or Line—well, you’re out of luck. Even LinkedIn, which Microsoft owns, isn’t currently supported. The Twitter app? Nope. This may be because Microsoft sees My People as a personal network, rather than a quick connection to colleagues. Still, the distinction feels slightly forced. I will say, though, that My People has potential. Right now, My People defaults to the last app you used with your friend as your “preferred app” for connecting with that person. 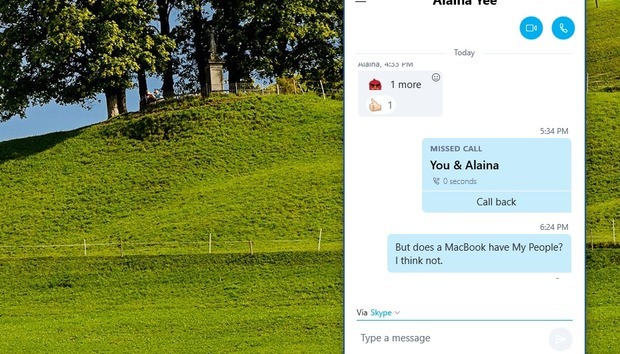 My People could be slightly improved by selecting a default app for an individual, so that your weekly Skype call with Aunt Sally wouldn’t be disrupted because you happened to email her yesterday. Ideally, My People would be a funnel through which you’d communicate with all of your friends via their platform of choice, whatever it might be. We already live in a world where some friends prefer to communicate via Twitter, some via Facebook, and some on other app platforms entirely. Unfortunately, Windows 10 lacks the basic capabilities to get that dream off the ground. Windows 10’s People app (not My People) lacks fields for inputting Twitter handles and Facebook names, even though there are dedicated Twitter and Facebook apps. Line? Snapchat? Forget it. Right now, even the Windows 10 People app doesn’t reflect the complex reality of the messaging world. It’s not all Microsoft’s fault, though. Until app providers enable My People support, they can’t connect, either. Think about it, though: We all have preferred ways of communicating: phone, SMS, text, email, Facebook, Twitter, Gmail, Snapchat. The list goes on and on. Do you check all of your social networks, every moment? Of course not. But wouldn’t it be fantastic to have a unified messaging interface to reach all of your friends, whatever the platform, whenever you want, without thinking about what network or app they’re currently using? That’s the basic premise of My People. And that’s a dream to get behind. This story was updated on Oct. 23 to confirm that My People is in the Windows 10 Fall Creators Update.